Welcome one and all to TLFG's Christmas and New Year Special. Apologies for the late publication again but two young kids, a wife with shingles, an annoying cold of my own and shift work take up quite a bit of time. This annual bumper edition covers the next two weeks taking you all the way through to FA Cup Third Round weekend on 5-6 January. This time of year is absolutely jam packed with games many of which are big local derbies. At non-league level there does seem to be quite a bit less action, especially on Boxing Day and New Year's Day but there's still plenty to entertain you including the return of Dulwich Hamlet to Champion Hill. On Boxing Day it should be possible to do a 'groundhop triple' and see three games but it will depend largely on whether you can get your hands on a ticket for Watford v Chelsea in the evening. Failing that, doing a 'double' should be very easy. With games kicking off at 1100, 1200 and 1230 getting to a 3pm game shouldn't be any trouble at all. There's a nice west London combo of Fulham v Wolves and QPR v Ipswich - tickets are still available for both. One thing to bear in mind over the Christmas and New Year period is how much public transport will be available. The London Underground will be running a decent amount of trains and there will be plenty of buses but National Rail services shut down completely on Boxing Day. As a result, going by rail to the games at Crystal Palace and AFC Wimbledon will be tricky as will some of the bigger non-league games at Boreham Wood, Dulwich Hamlet and Sutton United. There will also be an impact on journeys to watch Watford and Millwall but there are Tube stations within a 15-20 minute walk of both stadiums. As a general rule, always double check your travel plans before setting out as things can change quite a bit at this time of year. Lastly, many thanks this week to Will O and Chris T for their donations to TLFG's coffee drinking fund - it's much appreciated as I work on this well into the night. Have a great festive period and enjoy your football watching. The highlights of the next two weeks include action in the Premier League, EFL, FA Cup, FA Vase and most of our local non-league competitions. There are also some eye-catching U23 matches. Wealdstone v Slough Town @1pm - there's a midtable clash between two sides on the west side of town. Slough aren't a London club but reside just beyond the M25 to the north of Windsor so don't have to travel far. The sides have been averaging crowds of around 900 this season so there should be a decent turnout for this one. Hanwell Town v Hayes & Yeading United @3pm - at Reynolds Field the Magpies have a local derby to enjoy against the leaders who have scored a whopping 60 goals in just 15 games! The third round marks a hugely important stage in this famous old cup competition as it sees all the Championship and Premier League clubs enter the draw. On paper there are some pretty spectacular mismatches but consequently the chances of getting cheap tickets improve massively with most ties having plenty of availability. The games at Chelsea, Crystal Palace, West Ham United and Brentford are all on sale to non-members so fill your boots! Welcome everyone to the latest edition of TLFG and the final one before next week's Christmas/New Year Special which is going to keep me busy over the next few days. Once again I've been confined to barracks so haven't seen anything live but it's been a great week for the teams I follow. QPR ended their four-game winless run with a very impressive 2-1 win over Middlesbrough whilst Harrow Borough bounced back from their 7-0 mauling at Taunton Town (three players were sent off) with a 9-3 (!) win at North Greenford in the cup and a 3-0 win over Merthyr Town. The visiting Welsh side also organised a toy collection for children affected by the Grenfell Tower fire which Harrow supporters also took part in so every credit to all those involved. So what else has been happening in the world of London football? In the Premier League, the charge is still being led by Spurs who enjoyed a narrow win over Burnley but they're being closely followed by Chelsea and Arsenal. In fact it was a great weekend for the remainder of London's top flight clubs with all of them bar Fulham winning. Things are looking pretty grim for the Cottagers. They enjoyed a victory soon after Claudio Ranieri's arrival but have now failed to win in four. Although bottom, three points would put them right back in contention to stay up so it's not a lost cause just yet. In the EFL, League One side Charlton are the only one of our local clubs who appear to be mounting a serious promotion challenge. QPR have an outside chance in the Championship whilst Brentford, Millwall and AFC Wimbledon all seem to have long tough winters ahead of them. Since I last wrote, tickets for Dulwich Hamlet's first game back at Champion Hill on Boxing Day against Eastbourne Borough have gone on sale. The online allocation for this match appear to have sold out already but some are still available for the following game against Slough on 29 December. I think it's usually the policy of the club to hold some tickets back for sale on the day so getting to the Boxing Day game might still be possible but check with the authorities at Dulwich to make sure. Lastly this week it was great to be able to help out Gregor from Austria who was looking for a game today (Sunday). There was nothing on in London but I managed to find out that tickets were available for Southampton v Arsenal and gave him some travel advice. It all worked out well and he got to see a cracking game too. If you're prepared to travel that bit further but aren't sure about the logistics then get in touch. Given the highly interrupted sleep I'm getting at the moment, TLFG's coffee drinking fund is coming in very handy during my working days so thanks again to those of you who have donated. The highlights of the next few days include action in the Premier League, EFL and most of our local non-league competitions. There are also some eye-catching U23 matches and FA Youth Cup games. Harefield United v Broadfields United @3pm - in the 10th tier there shouldn't be too many games better than this. The two are currently first and second in the table and they groundshare - it should be a pre-Christmas cracker! Welcome one and all to this week's TLFG and apologies for the late publication. Work and childcare have caught up with me this week and the blog is back to match maps only as a result. I haven't really got very much more to add and don't have the time to anyway so enjoy your football watching and I hope to have a bit more for you next week. The highlights of the next few days include action in the Europa League, Premier League, EFL, FA Trophy and most of our local non-league competitions. There are also some eye-catching U23 matches and FA Youth Cup games. Greetings one and all and welcome to this week's TLFG. With my recently born daughter nearly six weeks old, this edition of the blog is pretty much back to full strength with all the normal features restored. 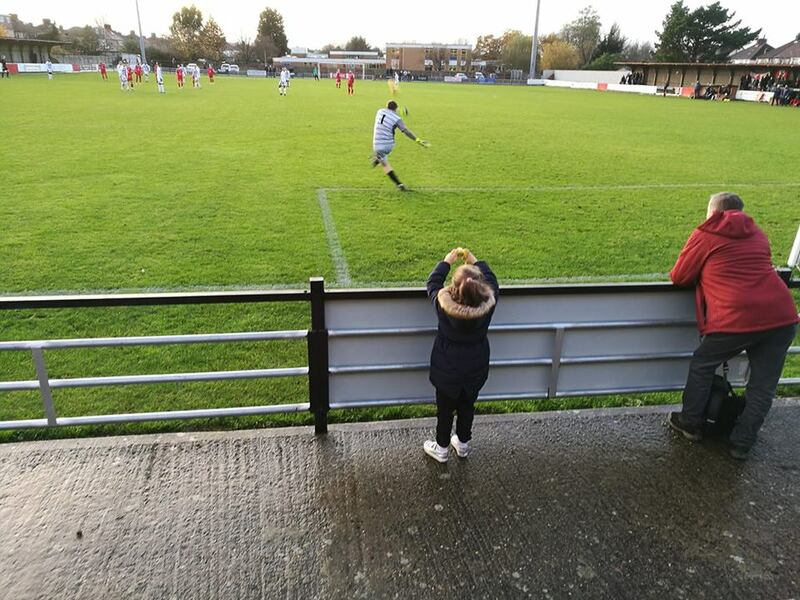 Not only that but I did manage to finally get to a game, taking my five-year-old to her first Harrow Borough match. With QPR playing Hull on my doorstep, it looked highly likely that that would be our destination but as a result of the fairly last-minute decision to attend, we'd have been looking at a whopping £50+ for the two of us to go! The purse strings are a bit tight at the moment so it wasn't that hard to decide that a non-league option would be better value. So with snacks and distractions secured in a rucksack we headed out to the north-western suburbs to watch The Boro who I followed avidly as a youth. Steve Baker's side have been a revelation since being moved from the Bostik League to Evo-Stik League over the summer. It was usually a case of trying to stave off relegation every year but now Harrow are play-off contenders and scoring for fun. On Saturday they welcomed a midtable Farnborough side for what could have been a tricky fixture. With two of Boro's stars of the recent past, Marc Charles-Smith and Kurtis Cumberbatch, in their squad they looked good on paper. However, that never even came close to being the case as Harrow totally played them off the park. After wasting a couple of gilt-edged chances, it took 28 minutes for the first goal to arrive when the ball was forced home from close range by top scorer Ryan Moss at a corner. It stayed that way until the interval and you thought it could be one of those days when a dominant team failing to score more could have been punished but that simply didn't happen. The goals just kept coming at roughly 10-15 minute intervals for the rest of the half as Farnborough capitulated. The 5-0 win lifted Harrow to sixth and also gave them the highest goals per game ratio in the division as they continue to entertain. Despite this, average crowds remain way below what they could and should be so if you live in the area, please get along and see them soon, you won't be disappointed. Next up they face an incredibly tough trip to leaders Taunton but in form like this who knows what they might achieve? As for my daughter she actually really enjoyed herself. A warm welcome from all the club staff she engaged with, a few treats from the tea bar and the chance to run up and down the terraces made a big difference. 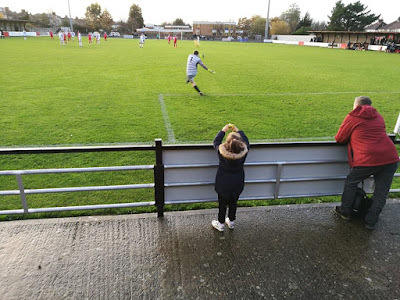 She also received a kids' mini camera as a present recently and spent most of the time photographing things - the match, the sky, the Harrow Borough Ultras or moss on the terraces. She even asked if we could come back the next day. Job done! When I think of her being restricted to an expensive seat at Loftus Road, getting bored and cold I know I definitely made the right call. The match at Harrow cost us £10 to get into (it was free for her), the programme was £2 (I only bought this because it was her first game) and I think I spent about £4 on refreshments (a hefty slab of bread pudding, a KitKat and a portion of chips). With the Tube and bus fares it probably totalled around £20. If you've got young kids then give non-league a try - they won't worry about the standard and will probably enjoy the experience a lot more. Brentford v Swansea City @3pm - at the time of writing the Bees have lost four of their last five and now lie just three points above the relegation zone. Swansea are back in this division after several years in the Premier League but aren't having it all their own way and are slap bang in midtable after also losing four of their last five. If you want to see two sides in bad form, this is the one for you!